Since it's again that time of year when the rainy days are becoming fewer and fewer, it is that time of year to throw a blanket and saddle on your horse and get out into the back-country or maybe go out and gather. While out, whether afoot or on horseback, we should all be aware of snakes that are pure trouble to run into. Yes, there's a very good chance that you may come across a snake of two while out riding. And frankly, while there are a number of fairly harmless snakes, venomous snakes in the United States include Rattlesnakes, Coral Snakes, Water Moccasins / Cottonmouths, and Copperheads. These venomous snakes have glands for secreting venom. They are able to inflict a poisonous bite. The wound they inflict can be deadly. Venomous snakes can be dangerous to those who work outdoors, which of course includes cowboys, ranchers, farmers, foresters, loggers, surveyors, landscapers, groundskeepers, gardeners, painters, roofers, pavers, construction workers, laborers, mechanics, and any others including military personnel. According to what I've read, there seems to be a real disagreement on the number of venomous snake bites recorded every year in the United States. Even though snakes bite an average of 45,000 people a year, venomous snakes bite account for 18 percent of that number. As for the number of deaths resulting from these bites, it is said to be under 20. According to the CDC (Center for Disease Control), although rare, some workers with a severe allergy to snake venom may be at risk of death if bitten. The CDC, also states that it has been estimated that 7,000 to 8,000 people per year receive venomous bites in the United States, and about 5 of those people die. Obviously, the number of deaths would be much higher if people did not seek medical care. So yes, it is vitally important for employers to train their workers about their risk of exposure to venomous snakes, measures taken so that they can prevent and protect themselves from snake bites, and what they should do if they are bitten. Four different species of venomous snakes reside in the United States -- though none of them would rank among the most venomous in the world. These include Rattlesnakes, Coral Snakes, Water Moccasins / Cottonmouths, and Copperheads. Rattlesnakes are a truly American family of pit vipers and all but two of the existing 27 species are found in the U.S. or Mexico. Known for their distinctive rattle at the end of the tail, all species of Rattlesnakes can strike at amazing distances and catch their victims by complete surprise. Rattlesnakes are divided between two genera based on their head scales: "Crotalus" have numerous small scales on their heads while "Sistrurus" have large scales (plates) on their heads. Rattlesnake venom is "haemotoxic", which means that it "prevents blood from clotting and destroys tissue." The potent and haemotoxic venom causes great pain and damage to tissue and death. Rattlesnake species include Eastern Diamondbacks, Western Diamondbacks, Mojave Rattlesnakes, as well as the Sidewinder, Timber rattlers, Rock, and Pygmy rattlesnakes. 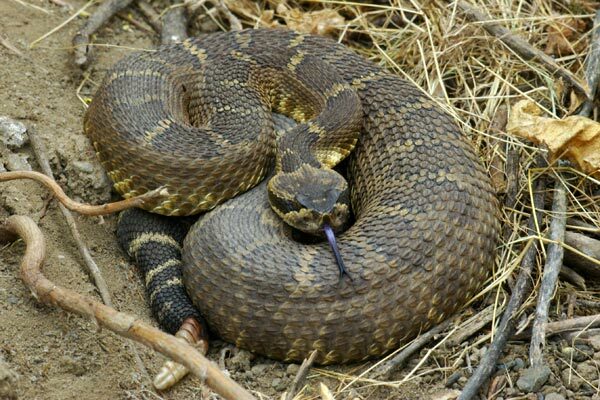 Rattlesnakes vary in size from the 18 inches of the Pygmy rattler to the 84 inches or more of the Eastern Diamondback. The Eastern Diamondback Rattlesnake is a species that inhabits the coastal areas of North and South Carolina, Louisiana and Florida including the Keys. They are found in pine woods, scrubs, palmettos or swamps. And yes, believe it or not, Eastern Diamondback Rattlesnakes are capable of swimming many miles out in the Gulf of Mexico to reach some of the islands off the Florida coast. As stated before, the Eastern Diamondback can reach up to 84 inches which makes it the largest venomous species of Rattlesnake in North America. It has no natural enemies and is considered the top of the food chain. Experts say Eastern Diamondbacks can be quite irritable and readily defends itself if it feels threatened. I've heard they attack for no reason as with most rattlers. As for more trivia regarding the Eastern Diamondback Rattlesnake, believe it or not, back during the founding of our nation, the Eastern Diamondback was almost selected as the National Animal of the United States. Yes, there were some who wanted it as America's symbol instead of the American Bald Eagle. As for the Western Diamondback Rattlesnake, this very aggressive rattlesnake is found in California, Nevada, Arizona, Oklahoma, Texas, New Mexico, and Arkansas. Actually, it is very common over to find them throughout the West in grasslands, deserts, woodlands, and canyons. The Western Diamondback is known to stand its ground and defend itself vigorously, the first step being when it coils and rattles. This species of Rattlesnake is responsible for many bites and injects a large amount of venom when it does bite. Although rattlesnake venom isn't as deadly as some other snakes in other parts of the world, the large volume of the injected venom makes Rattlesnakes particularly dangerous. And yes, because of this, Rattlesnakes are considered one of the most dangerous snakes in North America. After posting this, my friend Kirby Jonas let me know, "The Mojave rattlesnake, while not as large as the diamondback, is the most dangerous species due to the fact that it carries not only hemotoxin but NEUROTOXIN as well. This snake, like the diamondback, can also be fairly aggressive, and if one is bitten by it, IMMEDIATE medical attention is paramount." 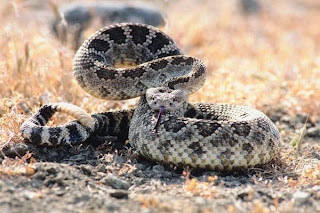 Kirby also said, that "it should be noted is that a large number of rattlesnake bites are 'dry bites.' In other words, no venom, or very little venom, is injected. The reason for this is that when a snake bites a person it is not biting to kill for food, but out of self defense, and it takes a while for a snake's venom to rebuild. Thus, not injecting venom is obviously not something the snake is doing to be nice, but simply a self-preservation tactic -- he is going to need that venom later to disable and kill something he intends to eat." These snakes live in the southern part of the United States, stretching from Florida to Arizona. They are prominent in west central Mississippi and North Carolina and south to the Florida Keys. Coral snakes are related to the cobra family and can potentially be extremely venomous though they are generally shy and slow to bite. Coral snakes thus account for fewer than 1% of venomous snakebites in the United States with most people bitten while handling the snakes intentionally. They are small snakes, measuring 39 inches or less. Their fangs are undersized, so many coral snakes are unable to penetrate skin. Though not very long, Coral Snakes cannot strike quickly and must hang on for a brief period to achieve significant envenomation in humans. Because of this relatively primitive venom delivery apparatus, it is estimated that 60% of those bitten by North American Coral Snakes are not envenomed. 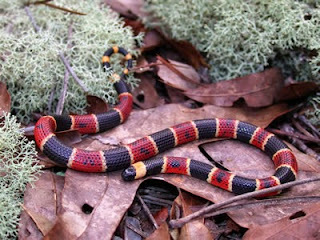 There has been no deaths from Coral Snake bites in the United States since antivenin became available. Before the availability of antivenin, bites killed 10% of the victims from respiratory or cardiovascular failure. Yes, t heir venom causes paralysis -- in particular, of the respiratory system -- and weakness. People who survive the bite may need respiratory support for up to a week and may suffer persistent weakness for weeks or even months. While that is said, it is also believed that for venom power that the most dangerous is the cousin to the cobra called the coral snake. It frequents a variety of habitats, such as wooded and scrub areas, palmettos and swamps, likes Coral Snakes like to hide in protected places such as beneath debris or flat wood, and it even ventures into residential locations. The saying "red on yellow kills a fellow" identifies coral snakes from other colorful snakes such as nonvenomous milk snakes, king snakes and scarlet snakes. The coral snake has red, yellow and black bands; if the red band and the black band are separated by a yellow band, you are looking at a coral snake. I read where these snakes are primarily located in the southeast United States - Southeast Virginia, west central Alabama, south Georgia, Illinois, east central Kentucky, south central Oklahoma, Texas, North and South Carolina, Florida, and the Florida Keys. But friends, I've also read where they are found throughout the South. Yes, this snake is one of the most common snakes in the South. It a semi-aquatic species living in swamps, lakes, rivers, ditches and brackish waters where it is easily mistaken for other harmless water snakes. Normally these snakes are between two and a half to four feet in length. It is well known that a Cottonmouth will stand its ground and is famous for flashing the inside of its mouth as a warning sign - hence the name "Cottonmouth". 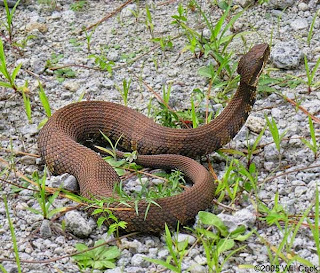 Some say the cottonmouth or water moccasin is a less deadly snake that has earned a reputation as being aggressive. But frankly, if harassed it will deliver a fairly potent bite. And yes, their venom is haemotoxic and their bites cause gangrene. Copperheads are the most common venomous snake in the eastern half of the United States -- notably in Alabama, Missouri and Arkansas. These short snakes cause 37 percent of venomous bites in the US. They derive their name from the copper-like coloring of their head. And yes, copperheads rely upon camouflage and cover for safety. In case of a danger, they usually freeze and remain motionless until the threat has passed. Unless a person steps on them, grasps them, or otherwise comes in very close contact with them, Copperheads will not usually bite. 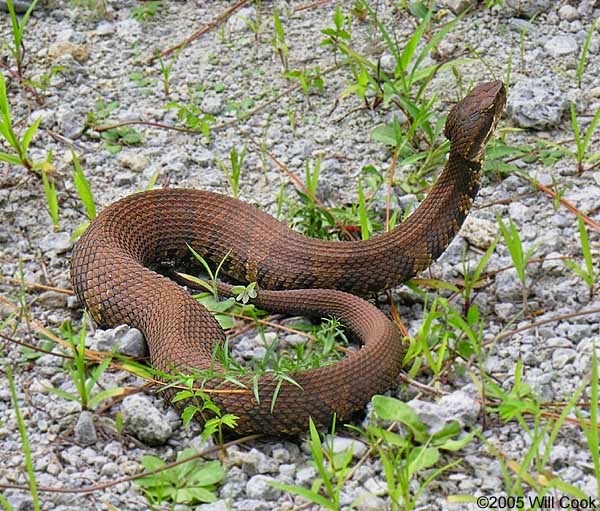 The relative abundance of Copperheads and their occurrences near human habitations is the reason bites from Copperheads are the most numerous among snake bites in the Eastern United States. Luckily this snake is said to be only "mildly venomous" -- whatever that is -- and bites are very seldom fatal. However, a bite may still have serious consequences. And the whole idea that a snake is "seldom fatal" is of absolutely no comfort to someone dying from one of those bites. There are 5 species of Copperheads in North America. Western species seem to have a higher venom toxicity and are much smaller than the Northern and Southern Copperheads. 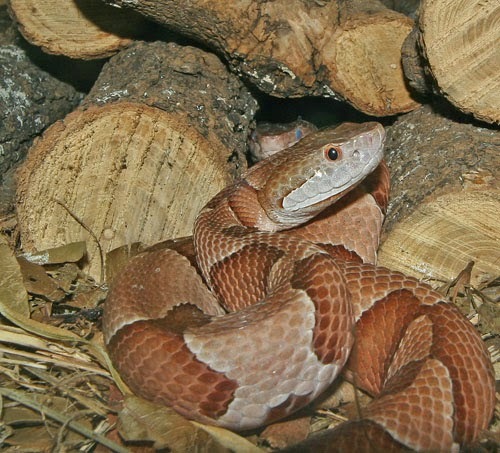 The American Copperhead is very common over much of its wide range: Eastern Gulf States, Texas, Arkansas, Maryland, North Florida, Illinois, Oklahoma, Kansas, Ohio, New York, Alabama, Tennessee, and Massachusetts. It is found in wooded and rocky areas as well as in mountainous regions where it is well camouflaged and hard to spot. Tough Copperheads are not known for their aggressive nature, they will defend themselves vigorously and bite when stepped on or if someone accidentally lies down next to them. Their venom is haemotoxic. Did you know that Alaska and Hawaii are the only two States that are said to being snake free? It's true. Of all of the 50 States, those two States are the safest to live if you are Ophidiophobia, also known as Ophiophobia, which is a particular type of specific phobia pertaining to the abnormal fear of snakes. And yes, this information was compiled from all sorts of sources. I hope you can use it!